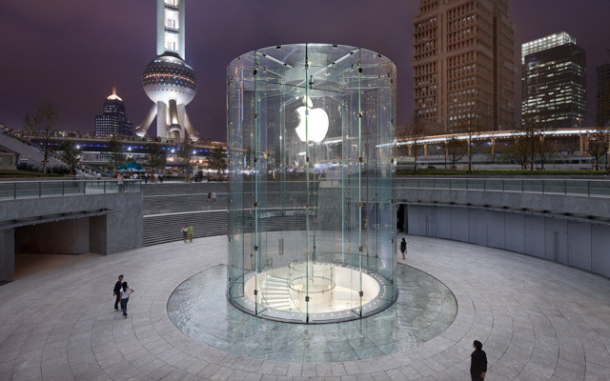 Apple awarded patent for Apple Store in Shanghai. Awarded Tuesday by the US Patent and Trademark office, the patent known as “Glass building panel and building made therefrom” describes the unique design of the cylinder. The structure is made of huge glass panels united by metal joints. But to achieve the cylindrical design, the glass panels had to be manipulated to curve precisely into the right shape. The structure itself also had to be strong enough to support itself and the stream of customers going back and forth. As such, the cylinder was outfitted with glass beams extending from the inner cylinder to the outer edges. Glass fins connect each area where adjacent panels meet. A building panel and a building formed therefrom, where the building includes a plurality of building panels arranged to form a cylindrical shape, where each panel comprises a single, or monolithic, glass piece, where each glass piece is substantially rectangular and includes two opposing long sides extending in a height direction and two opposing short sides extending substantially in a width direction, and where each glass piece forms an identical circular arc when viewed from either of the two opposing short sides. Apple also notes that the exact dimensions, shapes, and sizes described in the patent could be modified to create other types of buildings based on a similar design.